By Melissa Lennig on September 21, 2016 Leave a Comment. This content contains affiliate links. As an Amazon Associate I earn from qualifying purchases. 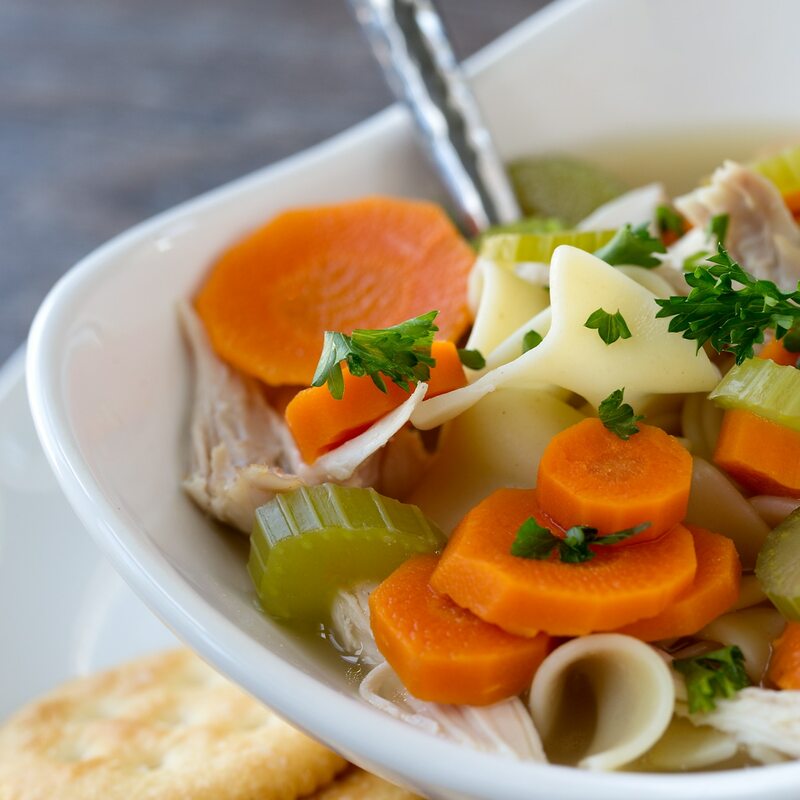 Inside: This simple and comforting Homemade Chicken Noodle Soup is loaded with healthy vegetables, soft noodles, and tender shredded chicken. My family loves the classic flavor and I love that it can be made quickly. 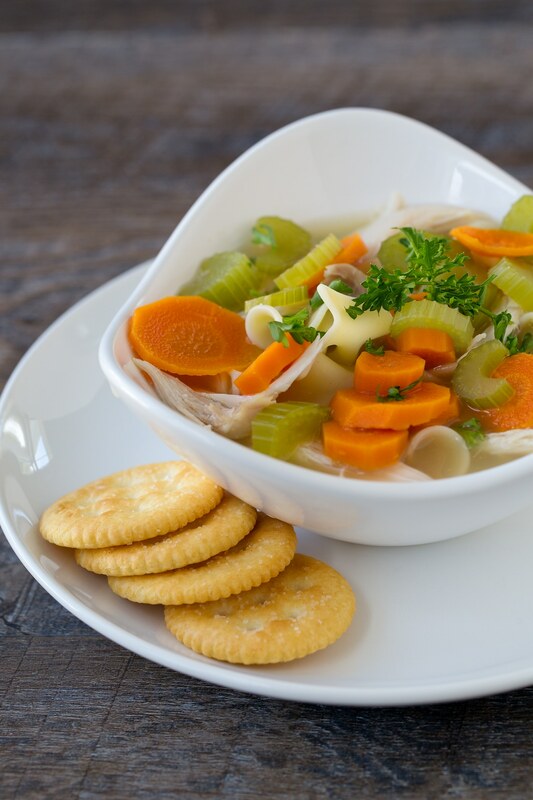 Shared below is the simplest way to keep comforting chicken noodle soup in stock for cold weather, illness, or just because your family is craving a hot, satisfying lunch. 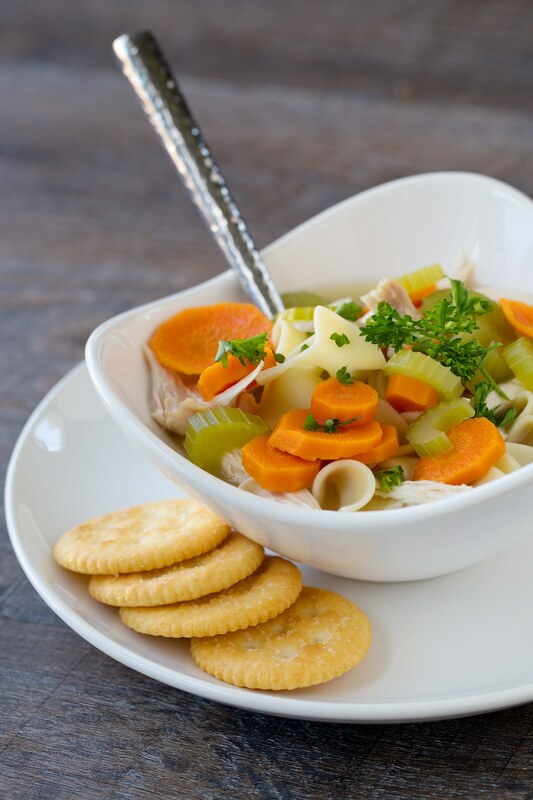 This Easiest Homemade Chicken Noodle Soup recipe tastes much better than canned soup and is packed with nourishing vitamins and minerals, making it perfect for fall and winter. It’s not even the end of September and already we’ve had colds and Strep throat passing through our home. During weeks like this, I’m thankful that I keep a stock of homemade chicken broth in our freezer. My method for keeping an “endless” supply of chicken noodle soup is shared below. Illness strikes during the most inconvenient, unexpected times. (Like September…when it’s 80° outside!) Because of this, let’s make the first batch of soup, quick! To get started, we are going to cheat. Ask the pediatrician to send your child’s prescription to the grocery store pharmacy. While your there, pick up all of the ingredients listed above. 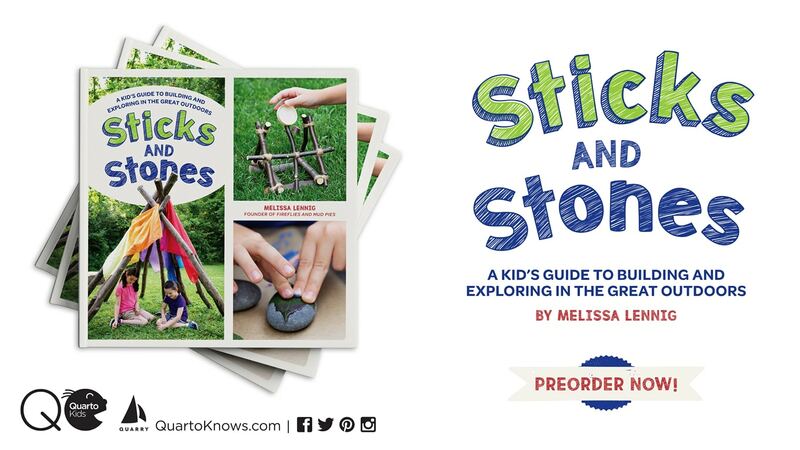 Your child will love you forever if you grab a box of popsicles too! When you’re back at home, pour the chicken broth into a stock pot with the carrots, celery, onion, garlic, fresh parsley, and peppercorns. Bring the soup mixture to a boil, then reduce heat to medium and simmer until the veggies are soft. When the soup is ready, remove the parsley, peppercorns, and onion. While the soup is cooking, remove the meat from the rotisserie chicken, but do not discard the bones. Prepare another pot with boiling water, then cook the egg noodles. Place chunks of chicken into a bowl, then ladle hot soup and noodles over the top. 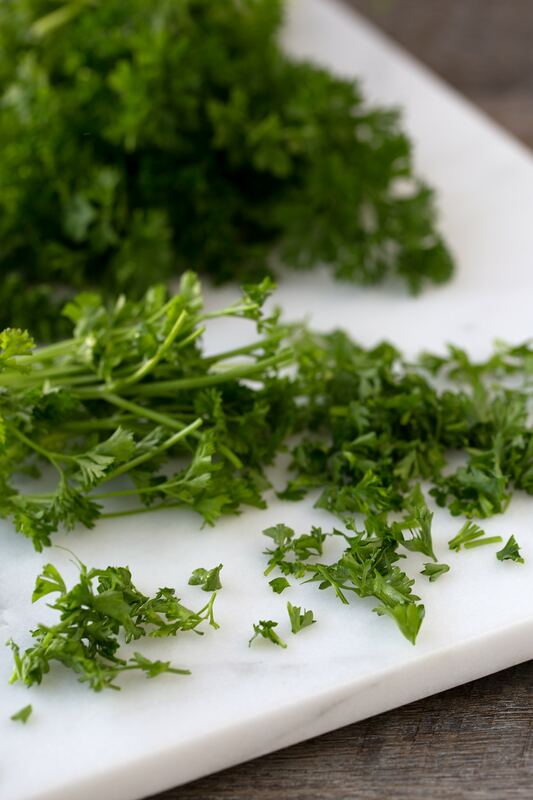 Garnish with fresh parsley, then serve with crackers or bread. Season with salt and pepper to taste. TIP: This method works particularly well for families like mine where some of us eat gluten-free, and some of us don’t. Keeping the noodles separate means everyone can enjoy the homemade soup. Now, remember how I said don’t throw away those bones? 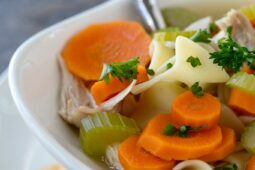 Toss those chicken bones into the slow cooker with 1 onion, 3 celery stalks (even the leaves), 3 carrots, 3 peppercorns, 1 bay leaf, 1 TBSP of apple cider vinegar, and 1 small bunch of parsley. I usually chop the vegetables into large chunks, but some people prefer to throw them in whole. Fill the rest of your slow cooker with water, then cook on low for 12–14 hours. When the broth is done, strain out the solids, then fill 3–4 hot wide-mouth glass mason jars to the “freeze line.” When the jars are cool enough to touch, transfer them to the refrigerator to solidify the broth. I usually get about 3 quarts of broth from this process. When the fat has hardened to the top of the broth, remove it with a spoon. Label the jars, then move them to the freezer for long-term storage. 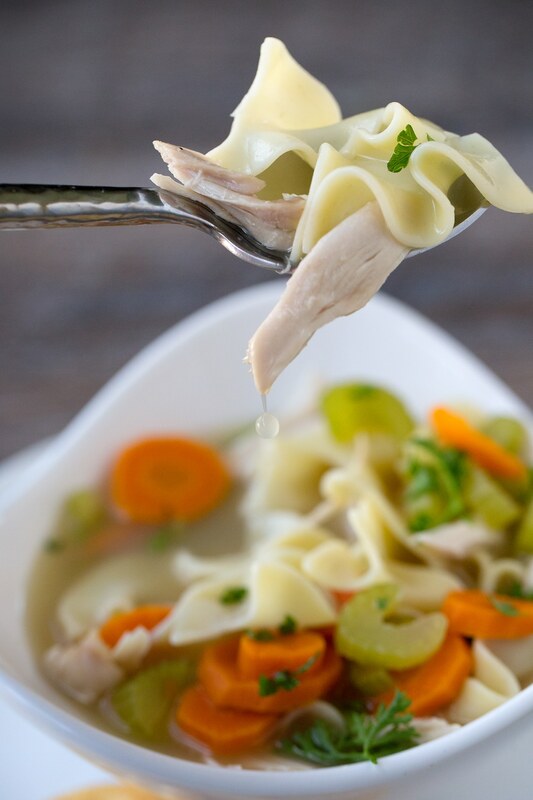 The next time your family needs homemade chicken noodle soup, simply pick up a rotisserie chicken, thaw your homemade broth, then start the process again! 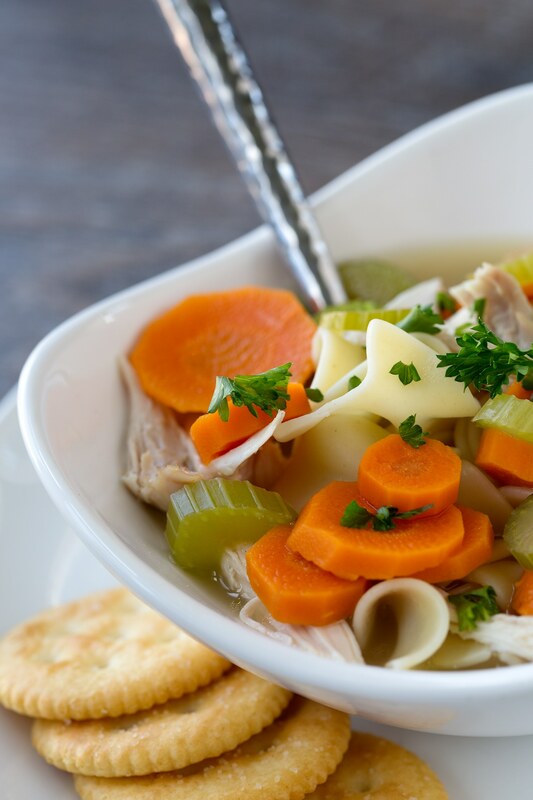 This simple and comforting Homemade Chicken Noodle Soup is loaded with healthy vegetables, soft noodles, and tender shredded chicken. My family loves the classic flavor and I love that it can be made quickly. 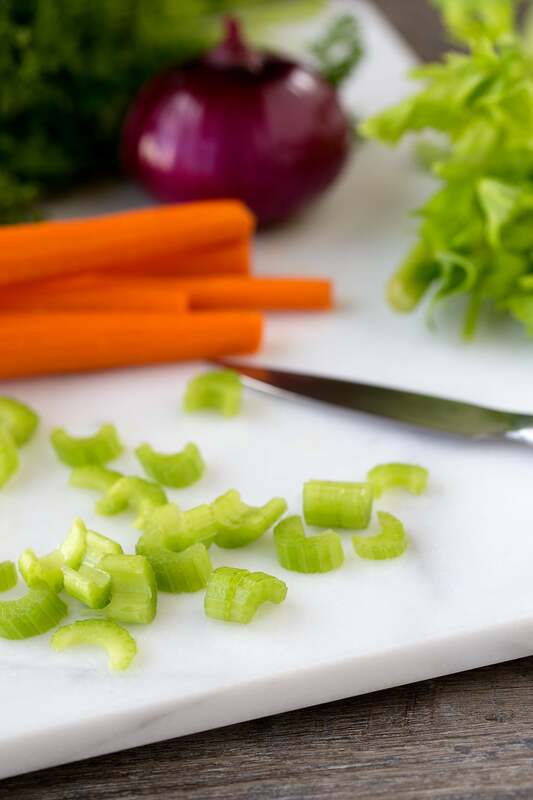 pour the chicken broth into a stock pot with the carrots, celery, onion, garlic, fresh parsley, and peppercorns. Bring the soup mixture to a boil, then reduce heat to medium and simmer until the veggies are soft.